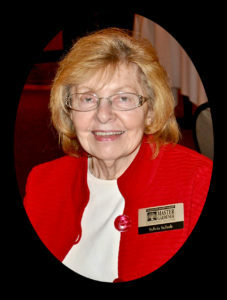 The Sylvia Schult Award was introduced in 2010 to recognize a member of the Master Gardener Society of Oakland County whose volunteer dedication and achievement is exemplary in serving the Society and its goals. 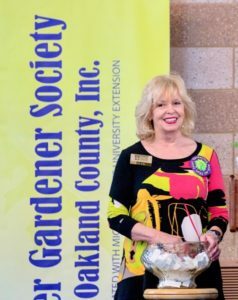 It was named after Sylvia Schult for all the work she has done on behalf of the Master Gardener Society of Oakland County since becoming a member in 1997 (21 years). Members are determined by the Board of Directors, and awarded based on volunteerism completed in the previous year. Nancy has served on several committees sponsored by the MGSOC including the Fundraising Team where she assists with planning events and selling merchandise. She accepted the Cookbook project and was able to sell the final 200+ books at various events throughout the state in 2016. For a grand total of 1,500 MG Cookbooks SOLD! Nancy has a knack of networking and has developed wonderful relationships with growers in southeastern Michigan. Through these friendships, she has acquired gift plants for the participants who attend our conferences. This year she is assisting with the Conference Ticket Sales and coordinating the speaker handouts and promotional materials. Betty has faithfully served as a team leader of the Program Committee since 2013 where she is responsible for the selection of the educational portion of the monthly MGSOC meetings. 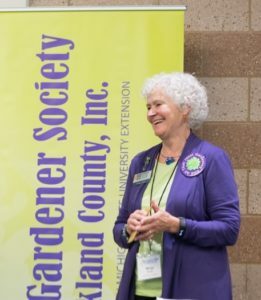 She has done a phenomenal job of finding interesting speakers who are experts in their field and who share the latest horticulture information with the MGs at our general meetings. Part of this job also requires that the technical needs of each speaker is taken care of. Betty makes it all look easy. Also in 2012, as we prepared to host our first Educational Gardening Conference, Betty headed the team to select and secure nationally recognized experts who were authors on the topic of “Elements of Design for Sustainable Landscapes.” As we are approaching our 5th Conference, “Gardening and All That Jazz – Instruments for Great Design” this year, Betty continues to provide the lead and has booked four outstanding speakers for our educational benefit. In addition, she coordinates the travel arrangements and hotel accommodations for their weekend in Michigan.